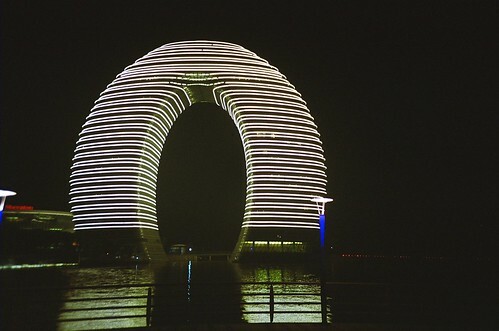 Sheraton Huzhou Hot Spring Resort, a luxury hotel and resort, located in Huzhou, China, has a very unusual design like a huge torus or 3-dimensional horse shoe. Because of its unusual shape it is locally known as Horseshoe Hotel or Doughnut Hotel. 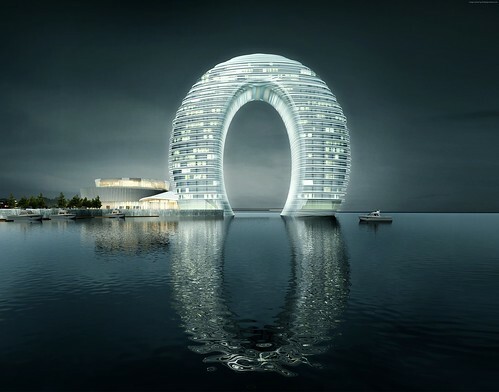 The hotel is located on the shores of Taihu Lake and its actual structure is fully oval or doughnut shaped, however its 2 floors are underground/below the water and 27 floors are above the water, giving it a look of horse shoe shape. The resort belongs to Sheraton Hotels and Resorts Chain of hotels and was designed and concieved by architect Yansong Maand of MAD Architects’ Xinhee Research & Design Center, Beijing, China. The hotel is illuminated in night with changing colours and it has also been billed as a Giant Glowing Doughnut.